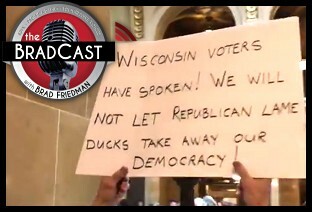 " Outrageous GOP Lame Duck Power Grabs in NC, MI and Especially WI: 'BradCast' 12/4/2018	"
In states where Democratic candidates did well in last month's midterms, leading to a loss of control by Republican lawmakers, there is now a desperate and brazen scramble in lame duck legislative sessions to pass laws in hopes of robbing power from incoming Democrats before they can be seated. In Michigan, for example, where Dems won statewide races for Governor and Secretary of State and voters overwhelmingly adopted ballot initiatives to expand voting rights, GOPers are jamming through last-minute legislation to prevent the Election Day registration that voters had adopted. In North Carolina, the Republican-controlled state legislature is ramming through a Photo ID restriction law before they lose their Super-Majority to override Democratic Governor Roy Cooper's vetoes. That action is particularly hypocritical as the state is in the midst of a massive absentee ballot election fraud scandal, apparently perpetrated by a GOP contractor and former felon hired by Republican Mark Harris in his race against Democrat Dan McCready for the U.S. House seat in the state's 9th district. Republicans claim that Photo ID voting restrictions at the polling place are necessary to prevent fraud --- of which there is little or none by voters --- even while calling for Harris to be certified by the state despite clear evidence of serious absentee ballot fraud on behalf of the Republican candidate. We've got more new details on that ongoing probe today, which has prevented Harris' reported win --- by just 905 votes out of more than 280,000 tallied --- from being certified by the state Board of Elections. But it is Wisconsin today where the GOP is attempting perhaps the most audacious power grab in the nation this year. As Republican Gov. Scott Walker was voted out in November in favor of Democrat Tony Evers, the GOP is attempting to usurp the powers of the incoming Governor, along with Democratic Attorney General-elect Josh Kaul, on a litany of issues before they can be sworn in. The new provisions, never mentioned by Republicans during the campaign, were introduced suddenly in a massive 144-page bill unveiled late last Friday night in a special legislative lame duck session called before Walker is finally out. Despite Democrats having won every statewide contest on the ballot in Wisconsin's 2018 midterms, Republicans were able to retain control of the wildly gerrymandered State Assembly. They received just 45 percent of the vote overall, but will nonetheless control 63 of 99 seats in the Assembly. This week, they are using that ill-gotten legislative muscle to swipe the incoming Governor and AG's powers. They hope to block the Democrats' campaign promises to expand healthcare and ease suppressive voting restrictions (which arguably resulted in enough voter disenfranchisement to narrowly give the state to Donald Trump in 2016). Republicans are also attempting to restrict early voting in 2020 in hopes of avoiding losses similar to those suffered by GOPers in 2018. The unprecedented Republican power grab has led to protests at the state capital in Madison this week of the type not seen since shortly after Walker took power in 2011 and immediately worked with the Republican legislature to strip collective bargaining rights from public union members. We're joined today by OneWisconsinNow's ANALIESE EICHER --- a plaintiff in the 2016 federal case which struck down the WI GOP's previous attempt to curtail early voting --- to detail the outrageous and unprecedented #WIGOPPowerGrab being strong-armed through the state legislature tonight. "What we're seeing here is the obliteration of the separation of powers," Eicher tells me. "We know that when Republicans don't like the results, they seek to change the rules and to change how things operate. With Democrats sweeping six statewide elections here in Wisconsin, the only option for the Republicans to maintain what they thought was their really, really great unilateral control of the State of Wisconsin is to make changes." "We're seeing everything from limiting local governments' abilities to do work on their roads, limiting their abilities to pay a prevailing wage, changing the makeup and composition of boards and commissions in Wisconsin, so that the legislature has equal or more power than the Governor in regards to appointments. We're seeing change's to people's abilities to get healthcare and receive benefits," she says. "We're seeing changes to the Attorney General's office, as to whether the Attorney General can leave a lawsuit or join a lawsuit," she explains, referring to Kaul's vow to remove WI from the federal lawsuit by several GOP-controlled states challenging the Constitutionality of ObamaCare and its protections for people with pre-existing conditions. "This extraordinary session bill severely limits his ability to essentially do what he campaigned on, and what people voted for him to do." As one Democrat noted during hearings today in Madison, the action being taken by the legislature "will invalidate the results of the will of the people and shows direct contempt for the voters". But, of course, that is the whole idea, since Republicans now clearly hate democracy. Eicher argues Republicans "want to stay in power, no matter what the cost" and suggests "voters are not responding well to what's happening in this extraordinary session." She believes they will pay a price for this in 2020. « PREVIOUS STORY "'Green News Report' - December 4, 2018"